In a study to be published today in Scientific Reports, researchers from the Florida International University Herbert Wertheim College of Medicine and the FIU College of Engineering and Computing describe what could be a breakthrough in the treatment of ovarian cancer: a novel way to deliver cancer-killing drugs using nanotechnology. In their lab experiments, Taxol, a chemotherapy drug used to treat ovarian cancer, was loaded onto a magneto-electric nanoparticle, and using an electric field the drug penetrated into the tumor cells completely destroying the tumor within 24 hours, while sparing normal ovarian cells. “Sparing healthy cells has been a major challenge in the treatment of cancer, especially with the use of Taxol; so in addition to treating the cancer, this could have a huge impact on side-effects and toxicity,” said Carolyn Runowicz, M.D., professor of gynecology and obstetrics and executive dean for academic affairs at the Herbert Wertheim College of Medicine. Ovarian cancer is the deadliest of all gynecological cancers. According to the American Cancer Society 14,000 women will die this year from ovarian cancer. This new treatment is the collaborative product of an oncologist and an engineer looking to challenge the odds and save lives. “This is an important beginning for us. I’m very excited because I believe that it can be applied to other cancers including breast cancer and lung cancer,” said Sakhrat Khizroev, Ph.D., professor of electrical and computer engineering at the FIU College of Engineering and Computing. 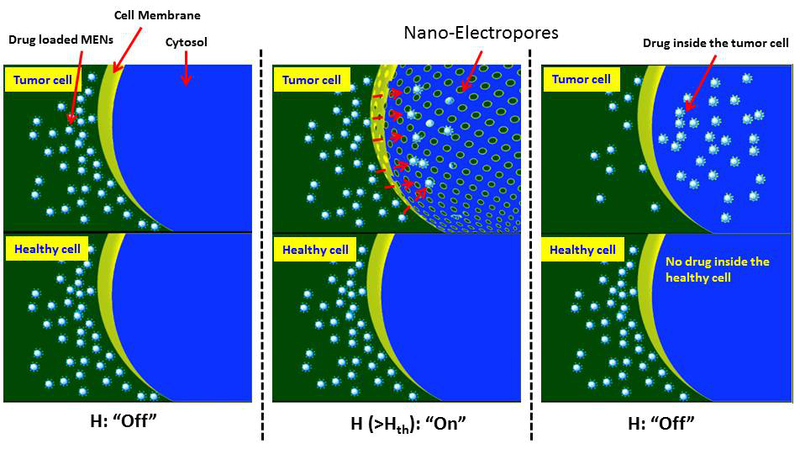 The illustration above shows both cancer and healthy cells in the same microenvironment. Special magneto-electric nanoparticles (MENs), which are loaded with the drug of interest, are administered through intravenous (IV) injection. When an external low-energy magnetic field is turned “on” outside the patient’s body, the pores in the membranes of the cancer cells (in the targeted part of the body) open up while the membranes of the healthy cells remain closed. Thus, the specificity of the targeted drug delivery to the cancer cells is achieved via control by a remote magnetic field on demand. Related: See how the magneto-electric nanoparticle technology works in this interactive graphic. I am an FIU student and I am studying Pre Med. I would love to be involved with this. Will clinical trials begin soon on this treatment?